Get reliable and secure storage for photos, videos, music and other files. The included SanDisk® SecureAccess™ software† provides password protection and 128-bit file encryption to keep private files secure while leaving the rest of the drive available for sharing. For added protection and convenience, 2GB of secure online storage‡ is offered for easy file backup and access to files from any web browser. 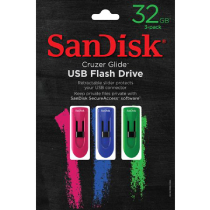 Enjoy peace of mind with SanDisk USB flash drives backed by a 2 year limited warranty.